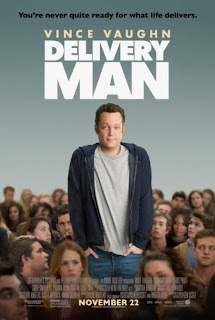 David Wozniak (Vince Vaughn) is the delivery guy for his family's meat company. From the start he seems unreliable in every area of his life. As his girlfriend breaks up with him and announces her pregnancy simultaneously, David realizes he might want to be a father, despite his best friend and lawyer urging him not to (the always-likable Chris Pratt from PARKS AND RECREATION). David’s desire to become a father is quickly fulfilled 533 fold. He finds out his samples from the sperm bank, which was made 20 years prior, was used almost exclusively by the bank. This makes him the father to hundreds of children, many of whom file a lawsuit in hopes that David will reveal his identity. DELIVERY MAN is a remake of the 2011 French-Canadian film STARBUCK (the name David uses when he donates to the sperm bank). As with the original, Ken Scott writes and directs the film, this time in English and with more star power. If it seems unnecessary to remake a film only a few years after its original, it is. Simply put, it’s an unfortunate trend in Hollywood right now (think DEATH AT A FUNERAL, which didn’t even call for the necessity of being translated to English). The film mainly revolves around David deciding to seek out his children, but never revealing his identity as he has “accidental” meetings with them. Most of the children are 20-year-old hipsters living in Brooklyn, but there are a few that stand out, such as his son who plays for the Knicks and another son who is mentally and physically handicapped. The movie tries to balance humor and sentimentally interchangeably, but it often feels contrived. There is a weight to the role, balancing this mess of a man who ultimately is trying to do the right thing, which Vaughn simply cannot carry. It should be noted that I’ve long rooted for Vince Vaughn to return to his past ability of mixing drama and comedy, but Vaughn seems to have lost a little bit of that flexibility and it’s nearly impossible for it to ever feel like David Wozniak and not Vince Vaughn. The film often meanders around with storylines that only feel half-fulfilled. David has serious debts (with seemingly serious consequences), complicated relations with his family and a strained relationship with his newest baby’s mama. All of which pop up randomly and without any real conviction. You find yourself wishing the film had tried to do less instead of overreaching. What starts as an intriguing premise ventures into worn and lazy territory.